West Orange - Cove CISD has a "Not Rated: Harvey Provision" rating from the Texas Education Agency. The direct link to the Federal Report Card page to search all school districts /campuses is available. Snapshot: School District Profiles are available on the Texas Education Agency website. Snapshot is an online resource that provides an overview of public education in Texas for a particular school year. In addition to state-level information, this product contains a profile about the characteristics of each public school district and charter school. For School District Profiles (or for previous years), visit the TEA website at: http://tea.texas.gov/perfreport/snapshot/index.html. Additionally, the WOCCISD Snapshot is posted at the bottom of this page, as well as Snapshot Item Definitions. The most recent Snapshot is from 2016-2017. They are released in January. 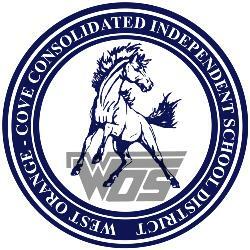 Community and Student Engagement Accountability information regarding West Orange - Cove CISD is viewable on this page, as well as a document for West Orange - Stark Elementary. CaSE information for West Orange - Stark Middle School, High School, and North Early Learning Center can be found on their individual campus webpages. West Orange - Cove CISD is accredited by the Texas Education Agency. Information regarding accreditation status is available on the TEA website: http://tea.texas.gov/accredstatus/. The majority of the above reports are provided in Portable Document Format (PDF) files on this page. Download and view.